Astronaut photograph ISS050-E-52210 was acquired on February 16, 2017, with a Nikon D4 digital camera using an 1150 millimeter lens, and is provided by the ISS Crew Earth Observations Facility and the Earth Science and Remote Sensing Unit, Johnson Space Center. The image was taken by a member of the Expedition 50 crew. The image has been cropped and enhanced to improve contrast, and lens artifacts have been removed. The International Space Station Program supports the laboratory as part of the ISS National Lab to help astronauts take pictures of Earth that will be of the greatest value to scientists and the public, and to make those images freely available on the Internet. Additional images taken by astronauts and cosmonauts can be viewed at the NASA/JSC Gateway to Astronaut Photography of Earth. Caption by Justin Wilkinson, Texas State University, JETS Contract at NASA-JSC. 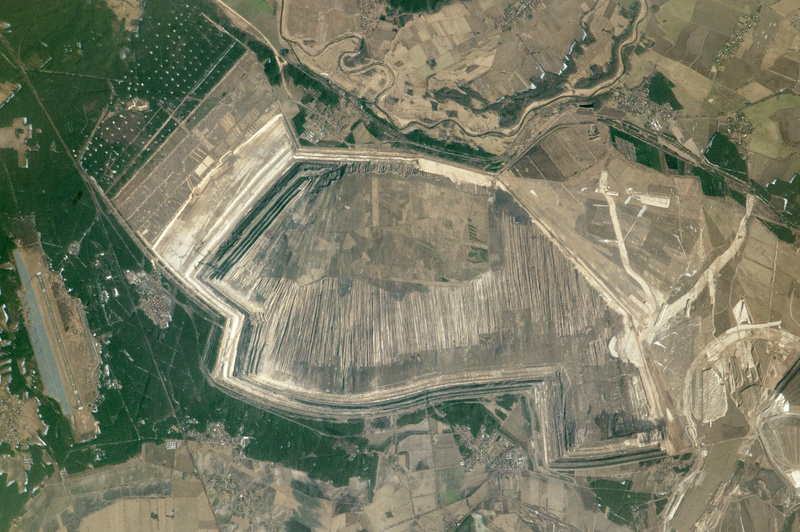 An astronaut on the International Space Station took this photograph of a strip mine in Germany, located along the Polish border at the Neisse River (Nysa in Polish). Here lignite, also known as soft brown coal, is being mined in large quantities to supply one of Germany’s largest power stations near the village of Jänschwalde. Using a long lens, the astronaut managed to capture the size and detail of the artificial landscape that results from strip mining. The rock face that is being actively worked casts a series of straight, dark shadows. Another strip mine is active immediately south (lower right). Immense excavator machines rip up the lignite; these can be seen at the west end of the face in the high-resolution download of the image. At this mine, the machines scrape off the overlying non-fuel rock layer (known as overburden), dig up the lignite, and then replace the mined strip with the overburden material as the rockface advances. This reclaimed “backfill zone” appears in the image as a series of lines parallel to the mining front, but lacking the shadow. Jänschwalde power station (just outside the bottom of the photo) is the third largest in Germany, with yearly power output of 22 billion kilowatt hours. At peak production it requires 80,000 tons of lignite fuel daily. Lignite is only economically mined if it lies near the surface and spread over a wide area. The area set aside for this mine is greater than 30 square kilometers (12 square miles).